Recently I had the privilege of having a live blood analysis with Lou Corona…(the first action that Lou suggests that his clients take before they start on a program with him) He does an analysis of your report and uses the information to tell you exactly what is going on with your body and what you can do about it. He uses both live blood and dried blood analysis to see any imbalances in your health. The first type, the live blood analysis, is basically taking a tiny pinprick of your blood under a microscope and looking at your cells. 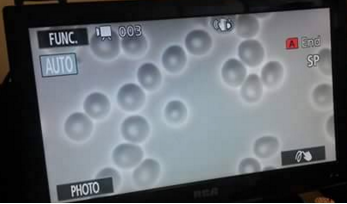 When you can actually see your own blood, alive, going about its business under a microscope, on an overhead monitor, well…the experience is “eye-opening: to say the least. It does something to you. You feel a connection to it and the cells almost speak to you and tell you what they need or don’t need. Apparently, I have average to normal healthy blood. 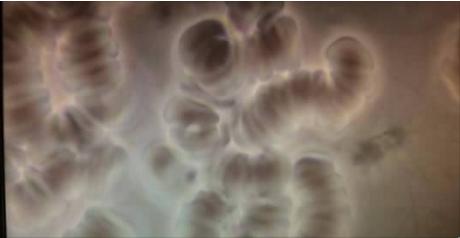 My red blood cells were round, plump and non-clumping, flowing freely through the plasma. This actually didn’t surprise me since I eat mostly greens, fruits, nuts, avocados in my diet and do an occasional cleansing. 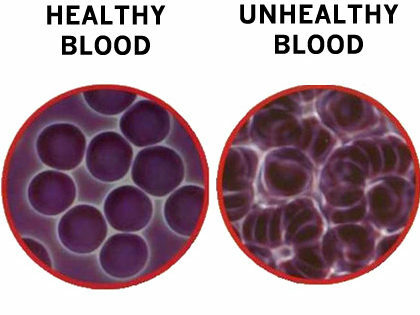 Blood that is not plump and round or blood that is clumped together or casting ghosts or shadows of themselves are a result of a toxic system and it at risk of disease. Lou did find, however, some things in my blood that could be a result of “Leaky Gut Syndrome” (When there is some damage to the intestinal wall or lining allowing some undigested food or other toxins to “leak” into the bloodstream) I found this analysis to be very enlightening. Since 80% of our immune system is located in the gut, I realized there are a few things I could do to rectify my situation. Lou told me that if you show signs of leaky gut syndrome in the blood, the best thing you can do is a complete colon cleanse and detox. Lou recommended I take Puracleanse, one t-spoon every morning with 6oz of water or orange juice and then wait up to 45 minutes before eating. It draws toxins to itself and breaks down the Mucoid Plaque in my intestines. Lou also recommmended I take Purazyme, Puradyme’s highly concentrated digestive enzymes. They go to work immediately on the undigested accumulation of proteins, carbs, fats in the system. He suggested I take them between meals on an empty stomach, an hour or more before meals or two hours or more after meals so that they work systemically in the body to digest all the accumulated toxins. His recommended length of time is starting off 3 times a day taking 3-5 and then up to 10 (3 times a day for at least a month but up to four months to get completely clean. Take 3-5 3 times a day and then up to 10 (3 times a day for at least a month but up to four months to get completely clean. Be well and take care of your body!